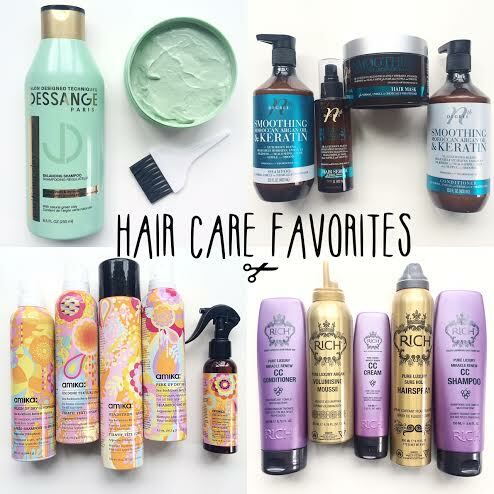 I’ve been testing tons of hair products the past few months in search for the best to help tame my somewhat unruly hair and the products listed below are the ones I love and can stand behind. My hair type: oily (needs to be washed daily) medium thickness, naturally wavy, has to be styled daily, or else it looks like something out of an 80’s music video.. 😉 You get the picture, I’ll take anything that will tame this wild mane and actually live up to it’s expectations. 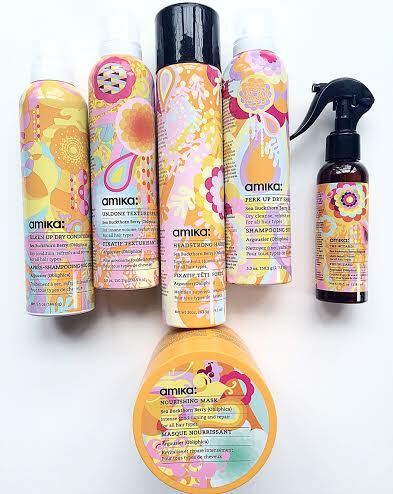 [* Amika *] My #1 all-time favorite hair care brand. I LOVE every single product of theirs that I’ve used. The bombshell blowout spray adds tons of volume without weighing down your hair, the dry shampoo & conditioner are THE best for extending your hairstyle a few extra days in-between washes. They soak up any oil, they smell amazing and don’t leave behind any of that white residue many dry shampoos do. I’ve mentioned my love for dry shampoo many times, these are by far my favorites. I introduced the headstrong hairspray & un.done texture spray in a previous post here. I use the nourishing mask once a week for 30 minutes (or so) and the results were immediately noticeable after my first use. My hair feels softer and smoother and looks healthier overall. I love everything about this brand, the packaging, the beautiful scents and most importantly, the results. I guarantee any product you try of theirs, you will love just as much as I do. I stand behind Amika 100%! 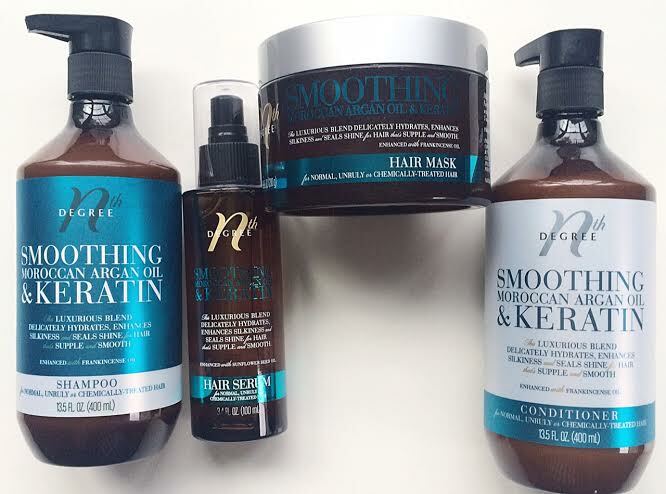 [* Nth Degree Hair *] Smoothing Moroccan Oil Shampoo & Conditioner. This is the first time I’ve used any products containing Keratin protein and I am impressed. These are VERY moisturizing and help tame frizz and they come at a very affordable price point. One of my only complaints with my hair is that it can be somewhat frizzy and these alone have worked wonders on my hair keeping it smooth and soft to the touch AND I feel like brushing my hair is a lot less of a task as the brush easily runs through with no effort. I’m super picky when it comes to hair serums, many of them leave my hair extra oily and just don’t add any beneficial purpose, not the case with this serum. I use this on the ends of my hair after every wash and it really adds extra smoothness without weighing down my hair. 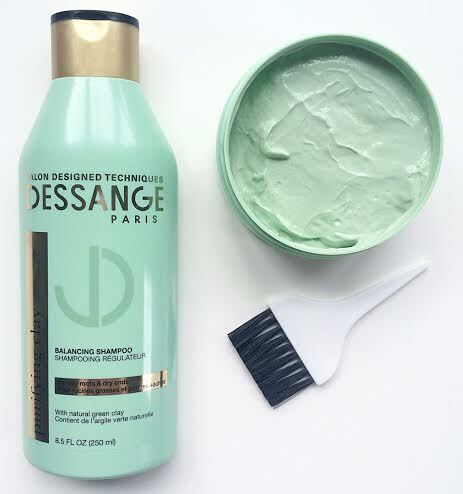 The hair mask is also an added bonus for restoring silky smooth, healthy hair. [* RICH Hair Care *] Miracle Renew CC Collection – The shampoo & conditioner contain a blend of argan oil (a personal fave), soy and corn proteins, and hydrolyzed wheat and are infused with wine extract and algae extract. 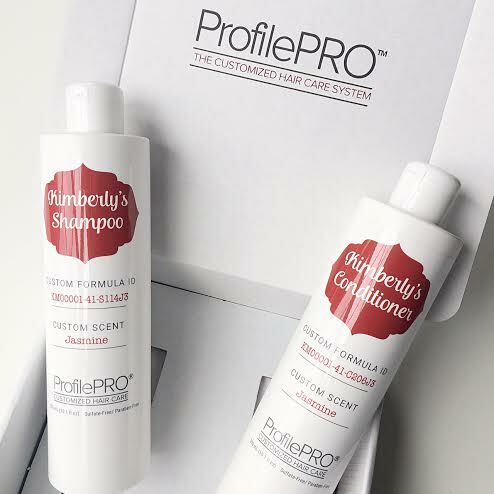 The shampoo protects, moisturizes and brightens hair color, and the conditioner adds volume. I love a good CC cream for my skin, and now I can say the same for my hair. Rich’s pure luxury miracle renew CC cream contains vitamin B complex, algae extract derived from seaweed and really offers “complete care” and protects against heat damage. 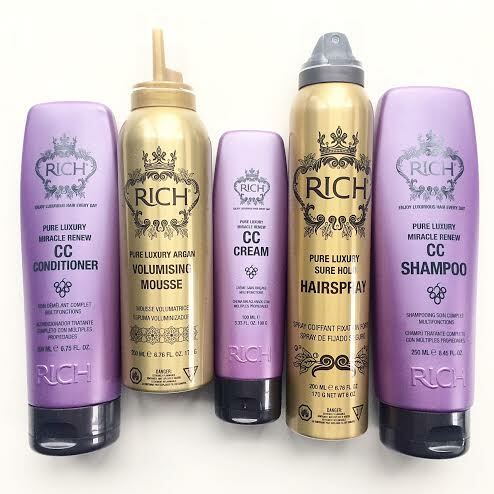 I use their volumising mousse & pure luxury hairspray on days I curl my hair, scrunch my hair or blow dry it. They add volume without making your hair hard or “crunchy” which is a huge NO thanks. The hairspray is really lightweight and you don’t need to use a whole lot to get a strong hold. [* Dessange Paris *] Pictured above is a 2-step system. The purifying clay balancing pre-shampoo mask contains an ultra-concentrated blend including mineral green clay, which absorbs excess oil and really purifies your scalp. I really love their purifying clay balancing shampoo as well. I’ll be honest, I was really surprised to find that this has been one of my favorite shampoos that I’ve used in a while. Proof that you don’t have to pay a lot for a quality hair products, and they’re available at target (YESSSS!). This is such a great option for those with oily hair. It’s infused with vitamin B which helps balance hair and minimize oily roots. The scent alone was enough to draw me in, cherry, violet and vanilla.. so fresh & girly. I felt like this delivered a good lather and left my hair feeling so clean and refreshed. I will continue to repurchase again and again. [* ProfilePRO *] I thought this was the coolest concept and was super excited when I found these. 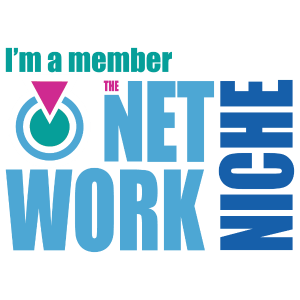 This company was actually created by an award winning stylist & salon owner after finding it hard to truly recommend products for individual clients based on their specific needs and hair type. How it works: you complete a short questionnaire (takes less than a minute!) and you get a completely customized formula of both shampoo & conditioner created specifically for YOUR hair. They formulate it based off of your hair type, texture, hair behavior, scalp condition and your favorite scent. You even get to customize the bottles they come in and this all takes just minutes and is SO simple and just a really awesome idea. My customized blend was based off of wavy, medium, normal, oily hair and I chose the Jasmine scent. The formula is sulfate free and contains no harsh chemicals and is created by cosmetic chemists in Italy and arrives to your house in about a week or so! I love that this set isn’t something off the shelf made for the masses, it was made just for me!